I dit some test to show how the BMPCC4K handles the red channel, after finding red blotches when shooting at night in the streets. When shooting raw, there is a solution provided by Captain Hook : add a nod in resolve with color transform and saturation mapping. It works very well. But the problem is : how does it works with a prores file and a prores file shot in video log ? It seems that the saturation mapping can affect some other parts of the image that are also saturated. And, another problem is that in this specific situations were reds are clipping, you just can't simply throw your files in any editing software, you have to put it through resolve. Is it an issue that could be solved with a new firmware ? ProRes in log gamma works almost same as RAW. It seems there is a bug in Resolve 15. ProRes clips are always set to Rec709 on import. You need manually change input color space to pocket4K log. Can you share original clip? You can download the original files in vimeo. I don't think it comes from a bug in resolve. Others NLE such as Premiere CC and FCPX interpret the footage the same way. You still have to use a node with saturation mapping in transform color to correct the reds, but it will affect others colors from your prores images. Last edited by slothorp; 10-18-2018 at 02:37 AM. In the interior test, these are the original footages, shot both in film log and in Extended video mode. Footage exported from video editing app with unknown settings and unknown workflow is not original. I remember it was a thread about UM4.6K with early firmware and it produced similar single color clipping with theatre lights when overexposed. So it could be firmware bug. Try do not overexpose. Digital sensors are hard clipping in highlights but keeps a lot of additional information in shadows. There was absolutely no color correction applied and you can find attached the project settings in the color management. Besides, the same original files in others NLEs show same clipping. Only Resolve with the color transform tool can handle the problem. I hear what you say about overexposing. But you can't control red lights in the streets coming from cars or traffic lights at night. You put ProRes Log footage on non color managed Rec709 timeline without setting input color space. This is wrong workflow. You can't set the input color space when you are in Davinci YRGB color science, only the timeline colourspace. This just shows that the camera is capable of producing color gamuts beyond the limits of common display color spaces. This is a good thing. 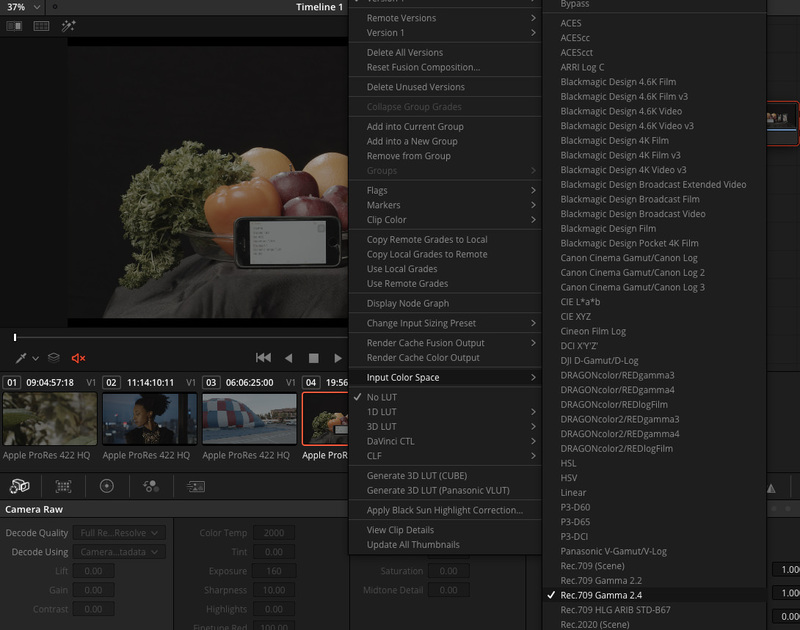 Resolve handles it well if you use YRGB color management to do mathematically correct color space conversion. My Digital Bolex produces an extremely broad color gamut in raw, beyond DCI-P3 or REC2020. The workflow I follow is to set the input color gamut to native camera color space and gamut, for Bolex CDNG that is CIE XYZ linear gamma. Then set the timeline to the color space you want to grade in. I normally use REC709 2.4 gamma. If you want to use LUTS, the timeline should be set to the colorspace and gamma the LUT was created for. This process correctly modifies the color gamut of the camera to conform to the display color space without chroma clipping. PS: Sorry, imbed is not working for me. Last edited by razz16mm; 10-18-2018 at 08:00 AM.